Happy Friday! Today I'm linking up with Charlotte, Lindsay, and Chrissy for their weekly happy and grateful list link up. Happy Thursday! 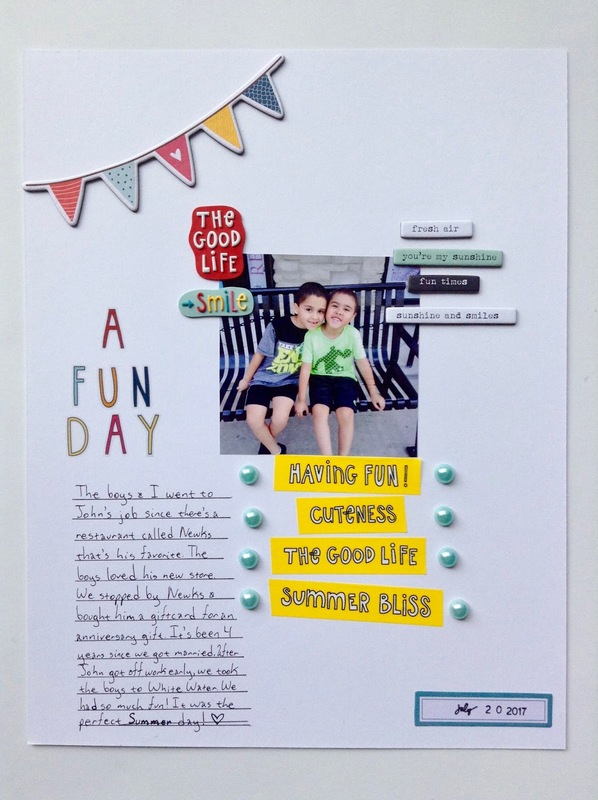 Today I'm sharing a layout I made using Freckled Fawn's July 2017 embellishment kit. I also used the June 2017 embellishment kit. 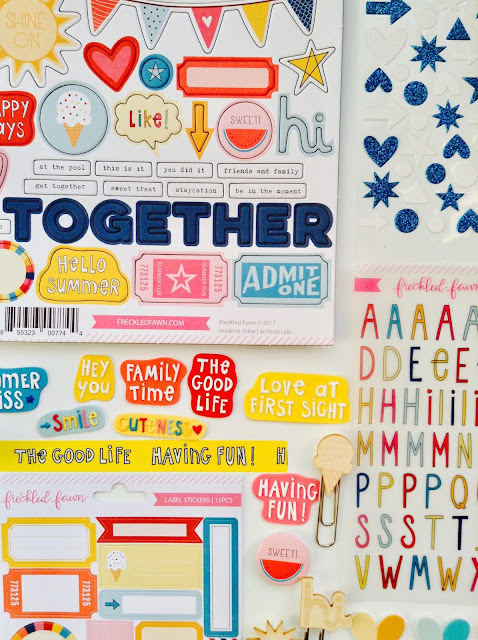 This month's kit is full of adorable embellishments and it's perfect for documenting your Summer stories. My wedding anniversary was on July 20 so I just had to document the day. The boys and I decided to visit John while he was at work. There's a restaurant nearby that he loves so it was the perfect opportunity to buy him a gift card there as a wedding anniversary gift. Since the area is "new" to us, the boys and I decided to go for a walk and explore all of the shops. I loved combining both the June and July kits. Both of these kits are Summer themed and coordinate very well. 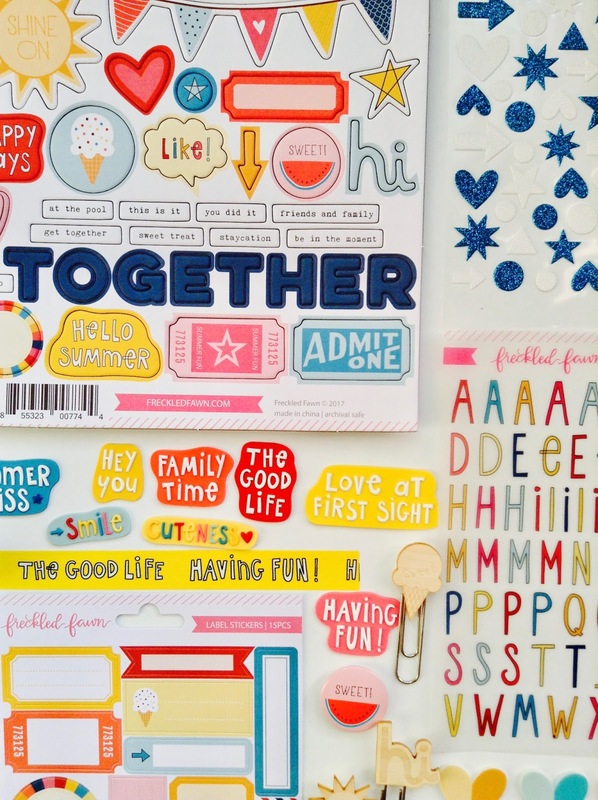 The chipboard word phrases and the pearl stickers are from the June 2017 kit. The rest of the embellishments are from this month's kit. I don't normally use rubber embellishments, but I am loving the doodle phrase rubber shapes. I may just have to order an extra pack of the rubber embellishments. I love this month's washi tape. It has several phrases and the font is so cute. I chose four phrases and added them below my photo. Then I added some of the pearl stickers on each end of the washi tape. The transparency alpha stickers are so awesome. 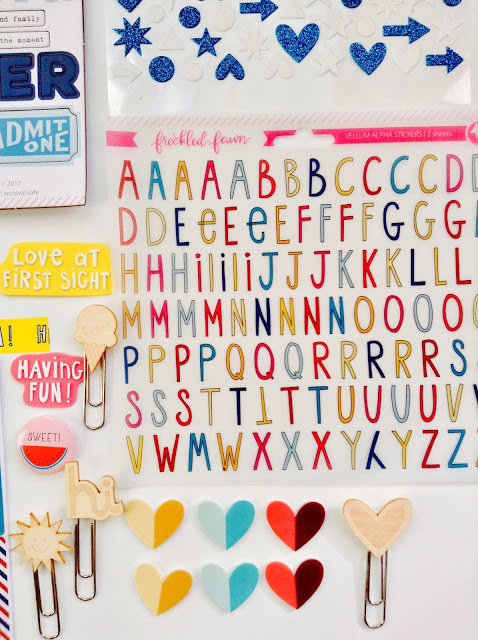 I really think that the font that was chosen for the stickers and washi tape is so cool. I knew I would have a hard time using the chipboard stickers from July's kit, but I just had to use the banner sticker on this layout. This layout was so much fun to make and is now one of my favorite layouts. I can't wait to continue to document my Summer adventures and stories. 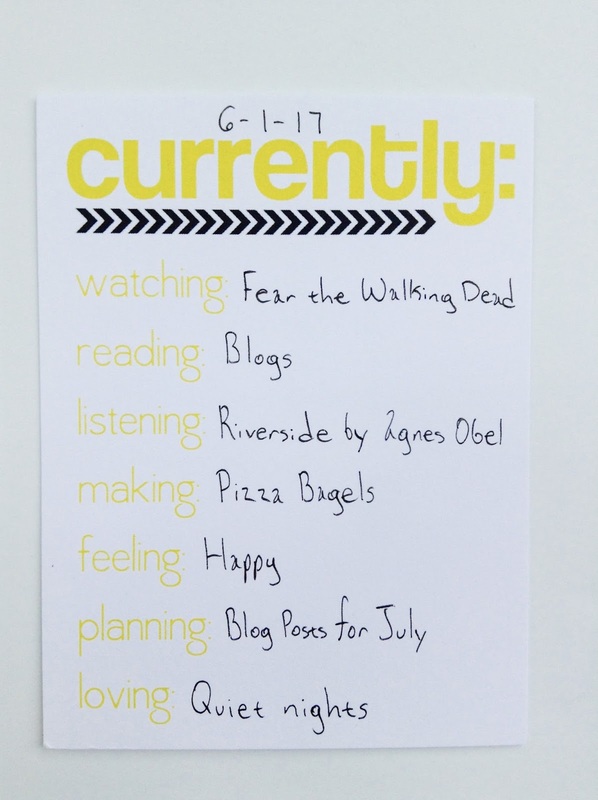 How are you documenting your Summer? Happy Wednesday! Today I'm sharing my take on Freckled Fawn's July Sketch Challenge. I was so inspired by how Megan used her frames so I decided to use the frames as well. I had been struggling to find a way to use up the frames that came in a previous kit. 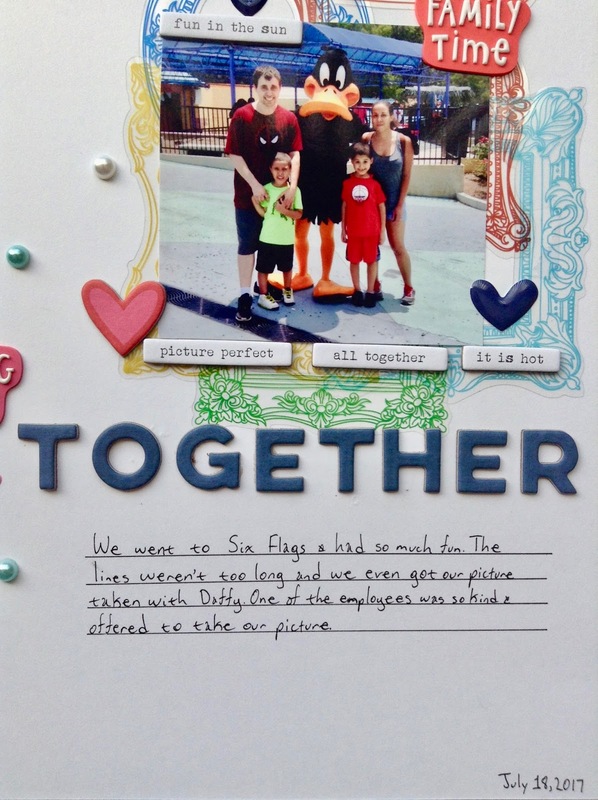 I decided to document our day at Six Flags. I tend to take lots of photos of my boys and husband so a lot of times I am not in the pictures. 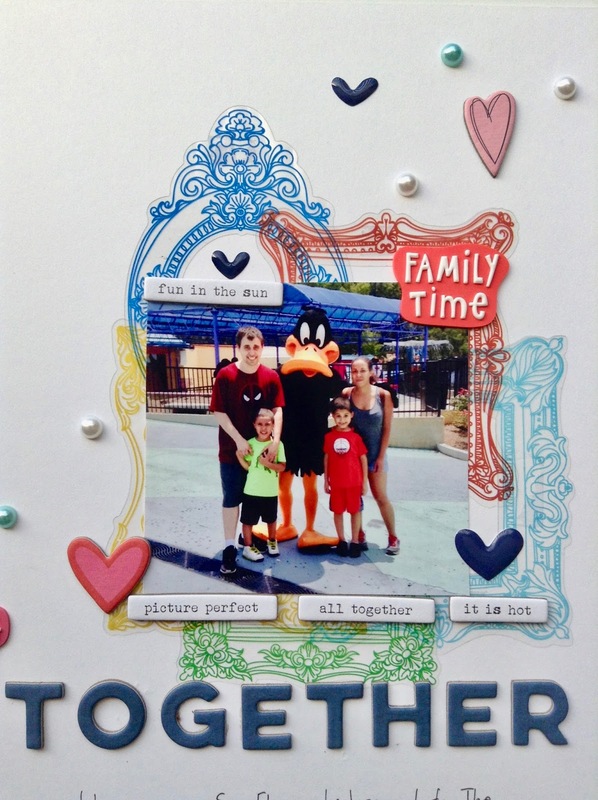 A really nice employee offered to take a couple of photos of us with Daffy Duck so I knew that I had to use the photo in a layout. I picked a few of the frames and adhered them together onto the cardstock. Then I added my photo. 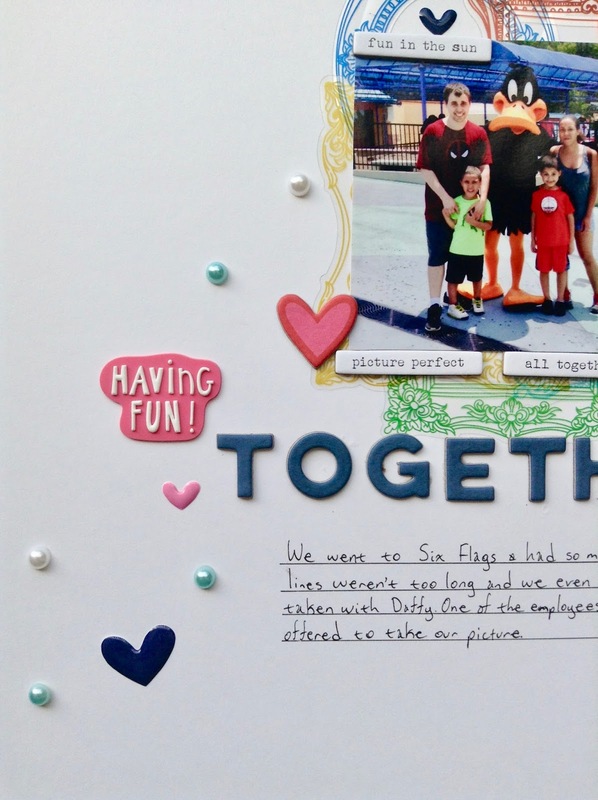 Once my photo was in place, I added the chipboard letters that spells out "Together" and then added my journaling. Then I just simply added the rest of the embellishments. I don't normally use rubber embellishments in my projects, but I am loving the new rubber shape embellishments that came in this month's kit. I really loved using the sketch because I was able to quickly put this layout together. I think sketches are also great when you have no idea how to use a specific product or when you're suffering from "creative block". Do you use sketches when creating? Watching: I'm still annoyed that Still Star-Crossed has been cancelled. I also watched Ouija: Origin of Evil. I love supernatural horror films so I was a bit excited to watch this. I also have to catch up on Game of Thrones and Attack on Titan. Reading: I caught up on some blog posts and emails. I also plan to finish reading my book this month. Listening: I love this song. Hopefully Christina Perri makes more music because her songs are amazing. Making: I just finished making blog posts for this month. I also finished my 100 Day Project. I made my last card on Saturday. Even though I did miss a few days here and there, I am so happy to say that I finished this project. Feeling: I find it amusing when people post articles based on the title or a caption without reading the article. For the past few days, I have noticed that my Facebook timeline has been filled with people sharing articles and being angry simply because of the title. They didn't even bother to read the article and if they did they would have known that it was a satirical article. Planning: I really want to get a bunch of blog posts written in advance for August. I've been wanting to share more personal stories for a really long time, but always end up getting afraid. I've been really inspired by Holl & Lane Magazine and love all of the personal stories that people share. Seriously finding out about this magazine really came at the perfect time. Loving: Old Navy has the best lounge pants ever. Unfortunately, Old Navy does not sell the ones that I have anymore, but they do have some other ones that looks comfy. Happy Monday! Today I'm over at The Nerd Nest with my take on this month's challenge. This month's challenge is to repeat a shape. You can check out my entire take on the challenge over here. Are you participating in this month's challenge? Happy Friday! 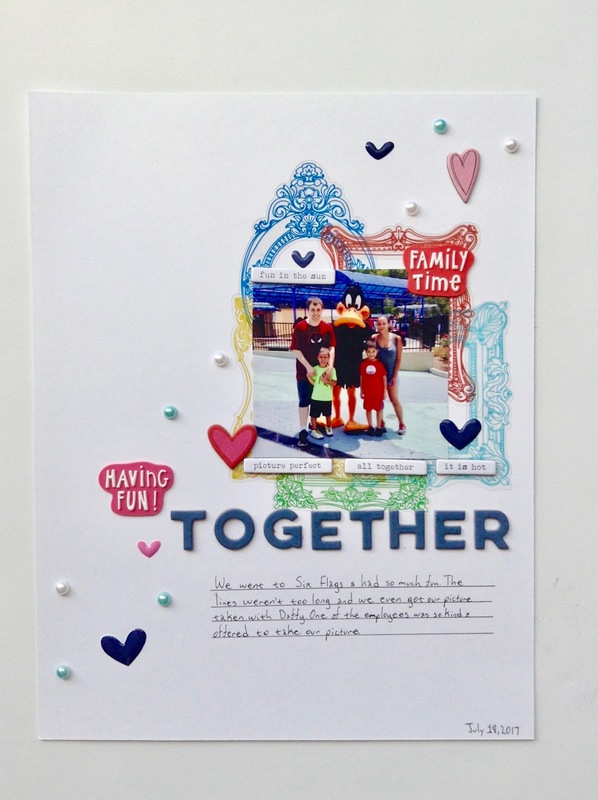 Today I'm linking up with Charlotte, Lindsay, Chrissy for their weekly link up. Last month, I mentioned that I planned to start a new Project Life album in July. I was really afraid to start a new album since I never did finish my old one. I felt so pressured to make a layout every week and eventually fell behind. This time, I decided that I would take it easy and just make a layout whenever I felt like it. 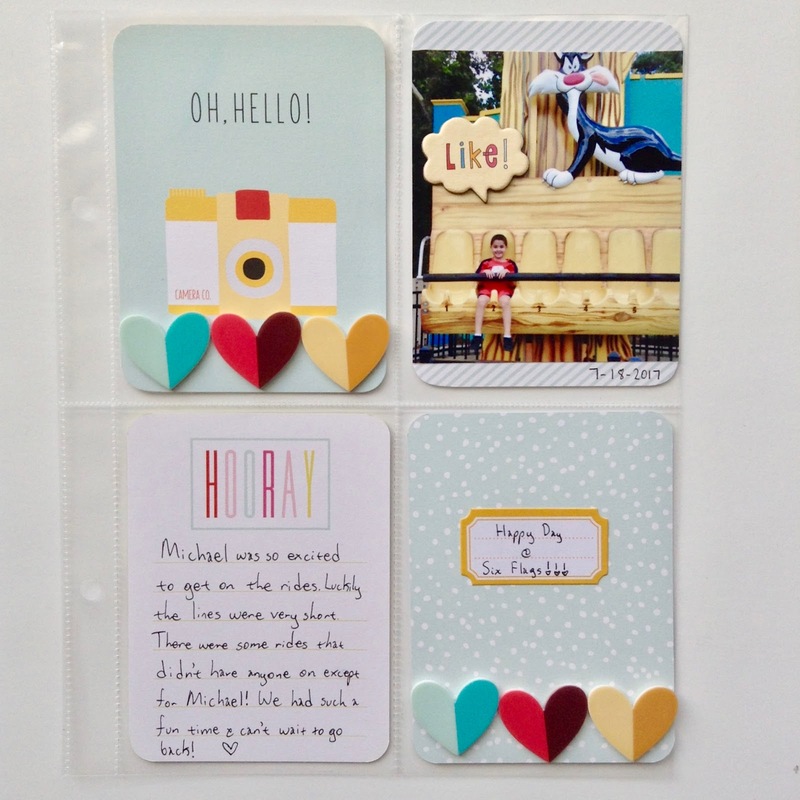 For this month, I decided to use Studio Calico's Fairground Project Life kit. This is an older kit that I barely used. Using a kit is extremely helpful because I didn't have to worry about going through my stash to find the right embellishments or cards. I also used a Currently List for my first layout. 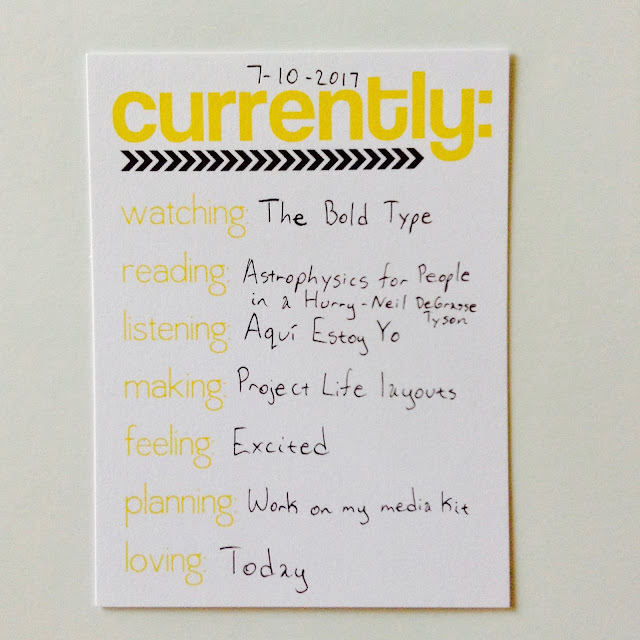 Currently cards are such a great way to document your day, week, or month. This chipboard piece is so cute, but I did have a hard time trying to figure out how to use it in my layout. I ended up adhering some different patterned papers to the chipboard and then adhered it to a blank Project Life card. I wrote down the year and made a couple of doodles. This is one of my favorite layouts. 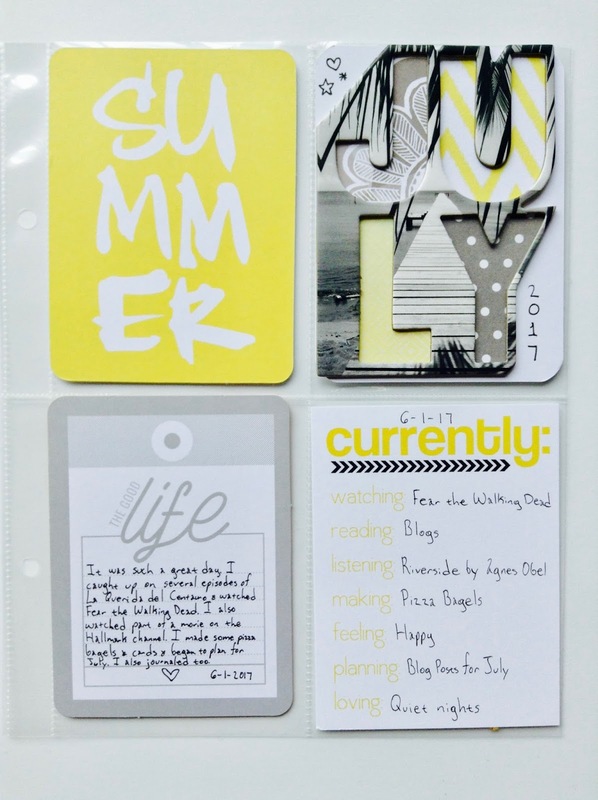 I love the "Dear Summer" card and decided to use the colors in the words as my palette. I chose two other cards that matched the colors as well as the coordinating alpha stickers. This is also one of my favorite layouts. Since this was a Fourth of July layout, I decided to stick with a red, white, and blue color palette. 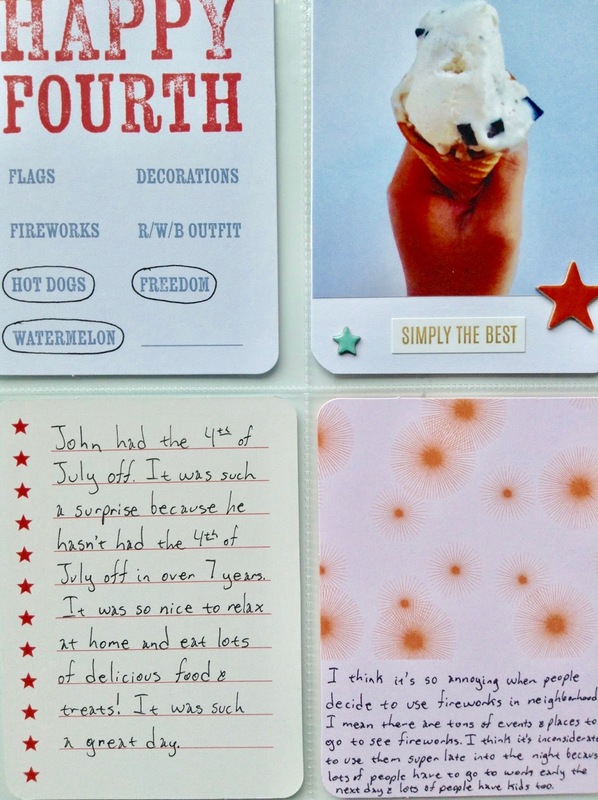 I adhered my photo onto a blank Project Life card and then embellished it with a blue and red star as well as used a phrase sticker as a sentiment. Below is a closeup of the layout. So far I am loving how this album is turning out. I'm not sure if I will only document my Summer, but I can't wait to see how this album looks at the end of the month. Have you started any new projects? Watching: This is a really interesting anime series. It's an adaption of the Japanese manga series Attack on Titan. I've been watching season 2, but plan on watching season 1 soon. The show isn't really scary, but it is a bit gory. Reading: I was finally able to catch up on some blogs. I've also been reading some articles on Holl & Lane Magazine's blog. I'm so glad that I found out about this magazine and plan on subscribing soon. Listening: This song has been stuck in my head for days now. I like the original version way better. Making: I'm still making cards for my 100 Day Project as well as some new cards for my shop. Feeling: July is always a busy, but exciting month for my family. I am so excited because my wedding anniversary is just a few days away! I'm not sure what we are going to do to celebrate, but I know it's going to be fun. I'm also excited because so many of my favorite shows are going to premiere on July 30th. Planning: I have so many projects that I have to (and want to) work on and I really need to get organized. Loving: Game of Thrones premiered on Sunday and it was such a great episode. I'm so excited for this season, but am really nervous about who may end up getting killed off the show. If you watch this show then you know that anyone can die. Seriously do not get attached to the characters. Happy Monday! 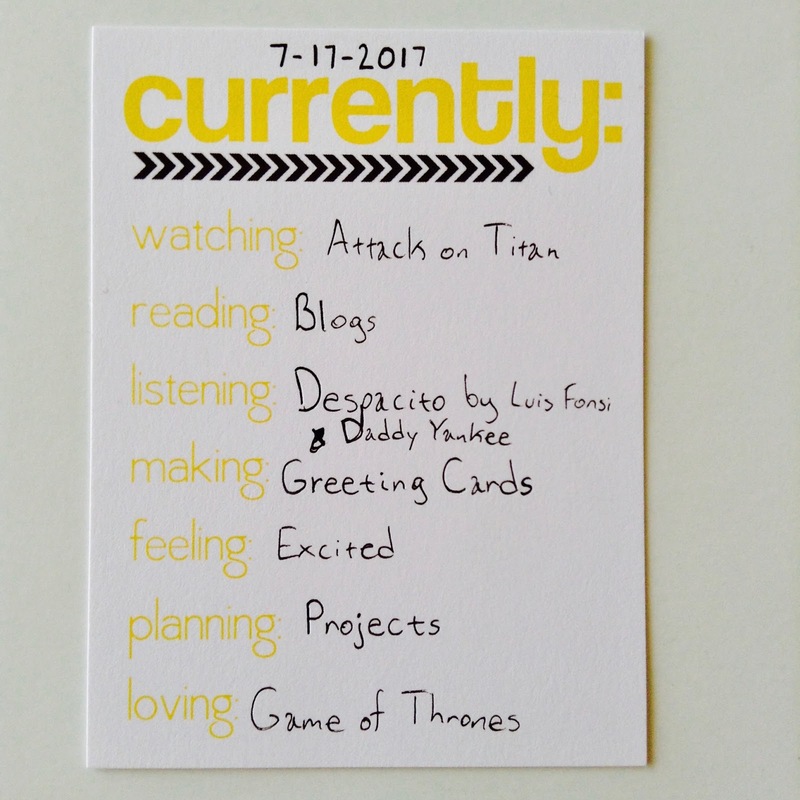 I'm getting close to completing my 100 Day Project and wanted to share a card that I made last Friday. I was inspired by Freshly Made Sketches. I used my new Freckled Fawn embellishment kit for this card. I also used two separate stamps for the sentiment. This card was really easy to make. 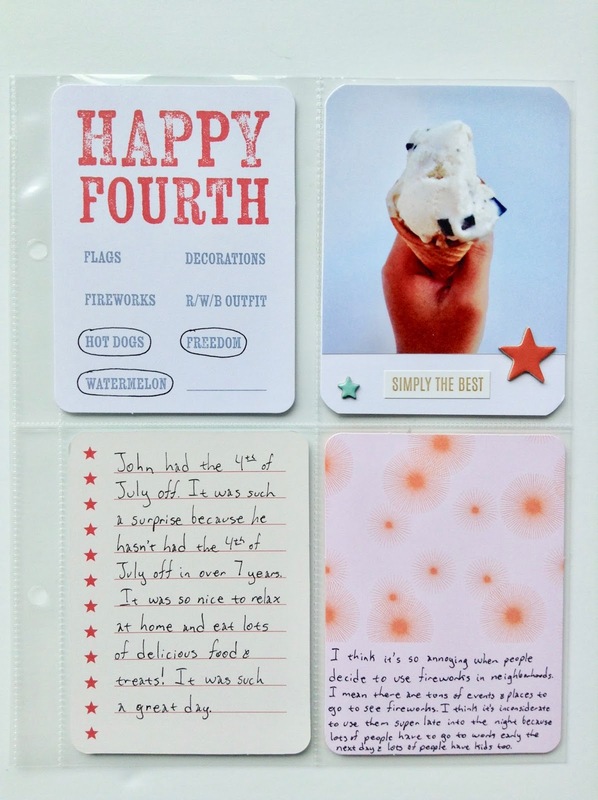 I used a washi stripe for the background and then punched a Project Life card using my circle punch. I adhered the circle with my Tombow Xtreme Adhesive glue runner. Then I adhered the resin flip flops to the circle and then added some pearl stickers. I wasn't sure what I wanted the sentiment to be, but ended up deciding to go with "Happy Summer". I used a Happy Birthday stamp that I have in my stash and made sure to only put ink on the word "Happy". 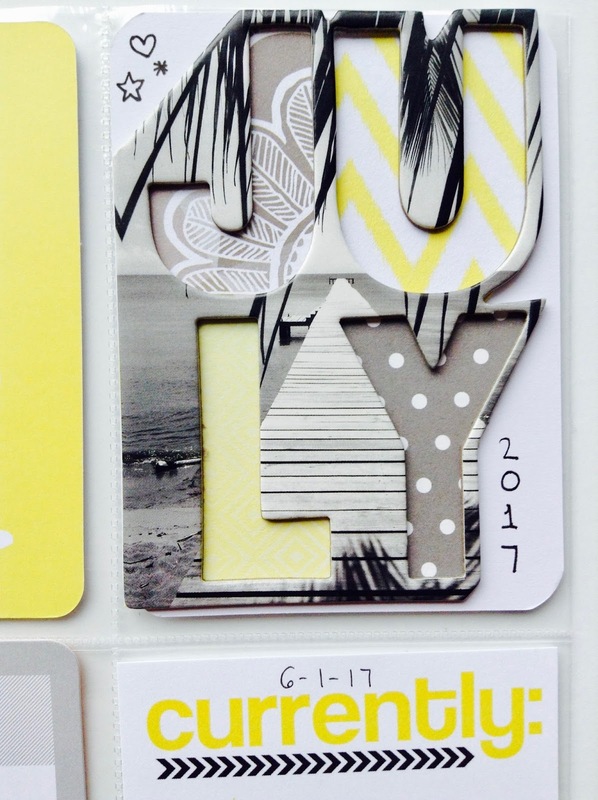 Then I used the "Summer" stamp from my Studio Calico stamp set. Once I stamped my sentiment, I added a few more pearl stickers and then colored the word "Summer" with my colored pencils. How was your weekend? Did you get to make anything? Happy Wednesday! I am so excited because my Freckled Fawn embellishment kit has arrived and I love it. 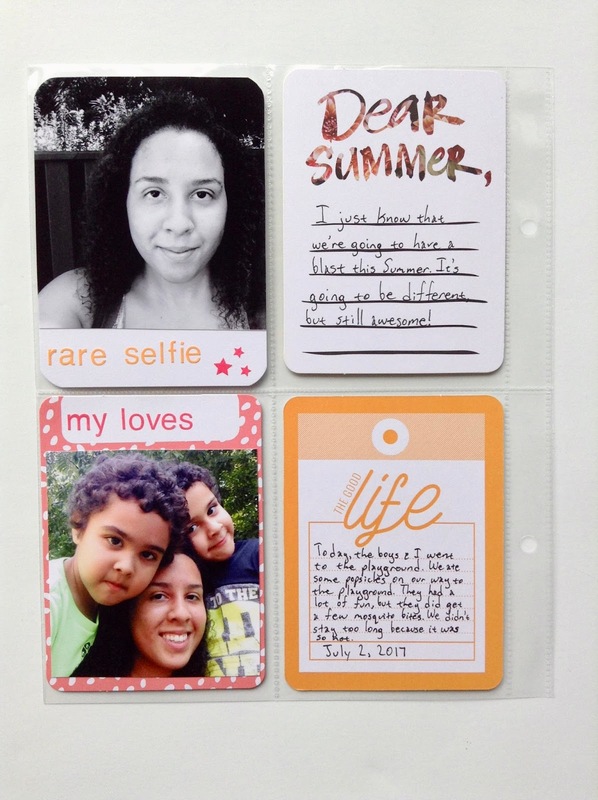 This kit is perfect for documenting your Summer adventures, making cards, layouts, and journaling. Below are some close ups of the kit. I love absolutely everything in this kit! The chipboard stickers and label stickers are so cute! This kit has several items that I don't normally use like rubber embellishments, but I have the perfect project for the rubber shapes. The alpha stickers and label stickers will be perfect in my personal journal as well as my scrapbook layouts, Project Life layouts, and mini albums. I don't normally use paper clips, but these paper clips are awesome! I think they will be perfect in my Project Life album. I also don't use a lot of resin embellishments, but I think I may make my own paper clips using the resin hearts. I love that this kit has a few items that I don't normally use because it will challenge me to get out of my creative comfort zone and try new things. And now for the exciting announcement...I am now a Freckled Fawn brand ambassador! I have been such a big fan of Freckled Fawn and have subscribed for a couple of years now. I absolutely love making projects using Freckled Fawn products. Do you subscribe to Freckled Fawn? What is your favorite item in the kit? Watching: I just watched the first episode of The Bold Type. I'm not too sure how to feel about this show. Some of the storylines looks like it's going to be interesting so I'll have to check out the next episode. Reading: I finally decided which book I am going to read this month! I'm currently reading Astrophysics for People in a Hurry by Neil DeGrasse Tyson. So far I am loving this book! I will post a review once I finish reading this book. Listening: Aquí Estoy Yo by Luis Fonsi is an oldie, but a goodie. You can check it out here. 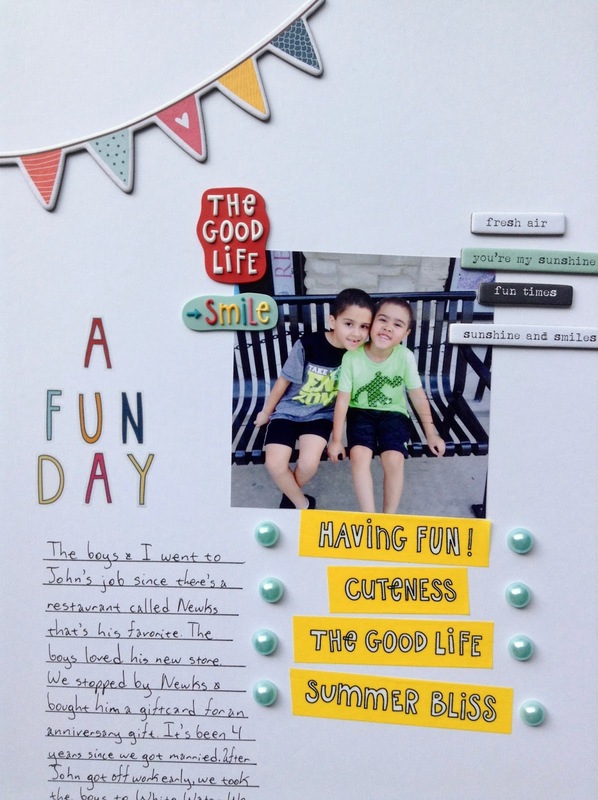 Making: I'm so glad that I decided to start Project Life again. I'm also glad that I decided to change how I am going to work on this project. I really think that the smaller format is perfect for me. Feeling: I'm so excited because my Freckled Fawn embellishment kit is going to be delivered today! 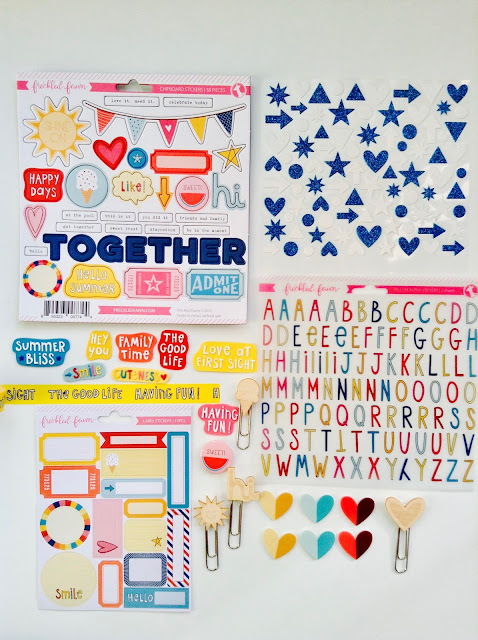 This month's kit is so cute and I can't wait to use it on my layouts and cards. Planning: I'm going to work on my media kit today (and the rest of the week). I would love to start working with brands and I know that having a media kit can definitely be helpful. Loving: It may be Monday, but it's been a great day so far. I was able to sleep in today. The weather is awesome. It's only going to be 84 degrees today which is way better than being 90 degrees and up. As I said before, my Freckled Fawn kit is going to be delivered today. Today is basically going to be a crafty day and I am so excited! Happy Sunday! 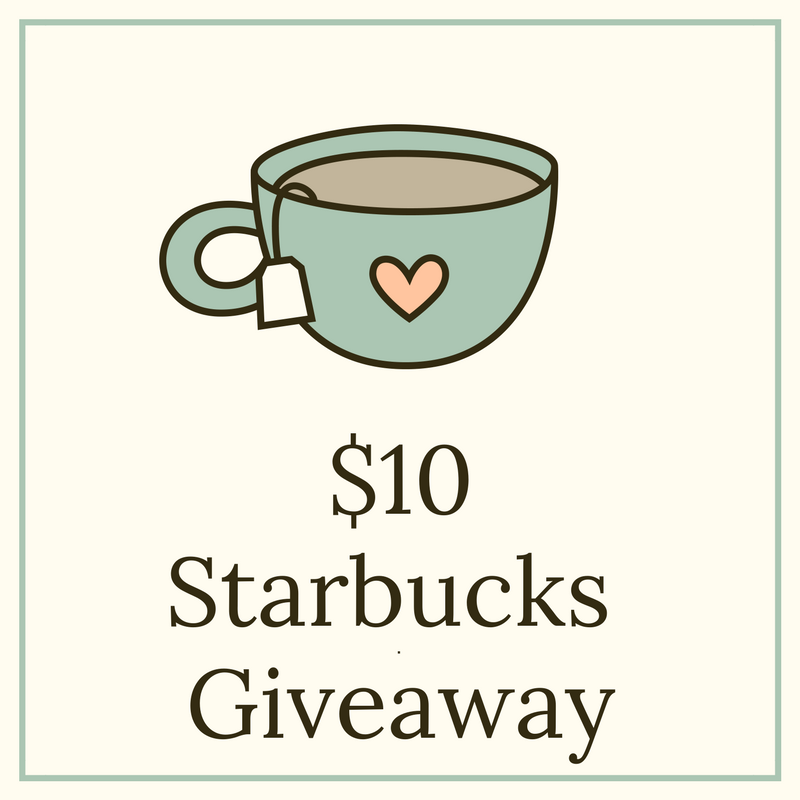 Lauren over at Shooting Stars Mag is hosting a favorite things blog hop and I am so excited to participate! One of my favorite places is Starbucks! My favorite Starbucks drink is a hot caramel macchiato. I used to only purchase hot caramel macchiatos, but I have been drinking a lot of iced caramel macchiatos and I am loving it. Don't get me wrong...I still love my "regular" drink, but it's nice to change it up every once in a while. Since I love Starbucks so much, I decided to giveaway a $10 Starbucks egiftcard. Just enter below. Good luck! Happy Tuesday and Happy Fourth of July! It's time for another Currently List. Watching: I caught up on an episode of Fear the Walking Dead. So far this season is actually pretty good. I also watched several episodes of La Querida del Centauro. I finally have only seven episodes left before I am caught up with the season. Thank goodness for my DVR. Reading: As usual, I read some blogs. I also need to choose a book to read this month and I'm having a hard time picking a book. I have so many books that I need to read so it's kind of hard having to choose one. Listening: I am loving Riverside by Agnes Obel. It's such a good song. Making: I love making pizza bagels. They are easy to make and are so delicious. Feeling: It was such a great day. I started working on my Project Life album, journaled in my Moleskine sketchbook, and made a card for my 100 Day Project. 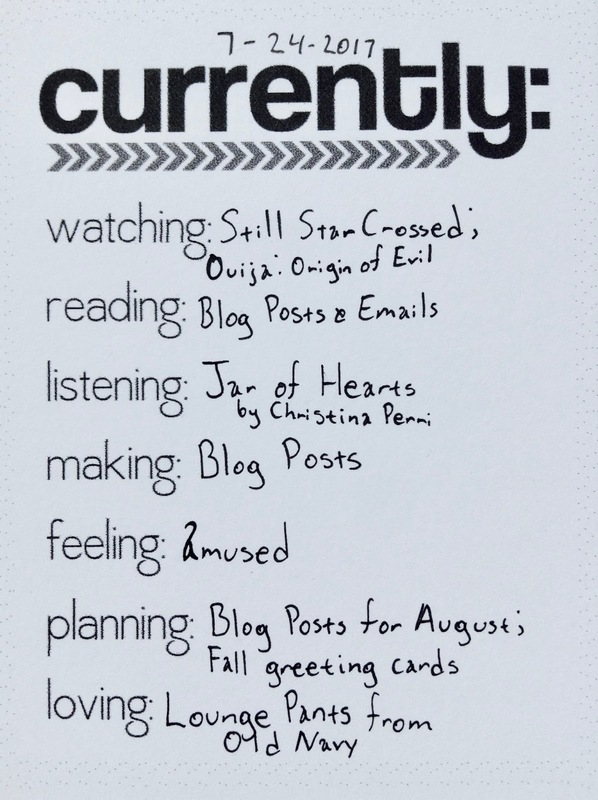 Planning: I'm currently planning blog posts for this month and I also need to make a lot of to do lists. This month is going to be really busy so I better get started planning...like now. Loving: I love quiet nights. I'm starting to love quiet nights way more than quiet mornings. Happy Saturday! Another month has passed and now it is July. Time really is flying by. 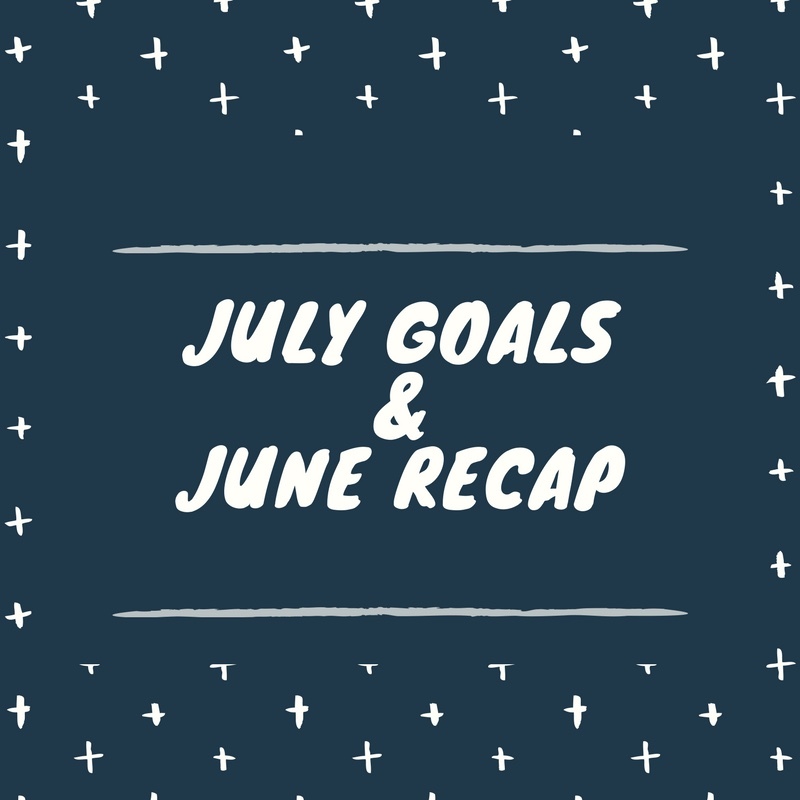 Today I'm going to share a recap of my goals for June as well as my new goals for July. Read 1 book: This was a fail. Although I did get some reading done, I didn't actually finish The Handmaid's Tale. Post 20 blog posts: This was a success. I am happy to say that I accomplished this goal. Drafting some posts in advance definitely helped me achieve this goal. Start journaling again: This was a success. I started journaling and I absolutely love it. I'm using a Moleskine sketchbook since I like adding writing, drawings, and small embellishments like stickers and ephemera. I love writing down my random thoughts, favorite quotes, ideas, etc. in my journal. Try 2 new recipes: This was a fail. I found two recipes that I want to try, but I didn't get the chance to actually make it. Do more research on buying a home: This was a success. I did a lot of research and am feeling a bit more confident with the process of buying a home. Work on handmade home decor: This was a fail. I had a hard time figuring out what I wanted to make and ended up getting frustrated so I decided to just skip the project this month.